In the Commonwealth of Massachusetts, there is case law that establishes what is known as “dram shop” case. A dram is a word which once commonly used to describe a measurement of whiskey that we would equate with the word “shot” today. In some parts of Europe, especially in and around the distilleries in Scotland, the term dram is still used. 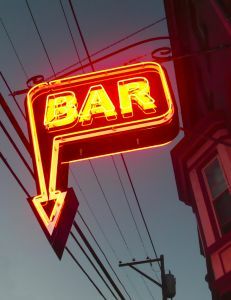 The word indicated a store, or more commonly a bar, where alcoholic beverages were sold by the drink. Every bar owner and employee who is serving alcohol to the public has a responsibility, and legal requirement, to not serve any patron who is already intoxicated. They are also not supposed to serve someone to the point of intoxication that they know or should know will be driving a motor vehicle under the influence of alcohol. If a person goes to bar and gets drunk, he or she could likely be involved in a serious drunk driving car accident that could result in serious personal injury or death. If the driver hits another driver or pedestrian, and that victim is seriously injured, he or she could obviously file a negligence lawsuit against the drunk driver. It is well-settled law in the Commonwealth of Massachusetts that a driver owes a duty to act in a reasonable and prudent manner as to prevent foreseeable injury to foreseeable persons and property. In other words, a person cannot drive a motor vehicle while drunk. If they do so, they are breaking the law and could be arrested. If that person causes an accident, they would also be deemed negligent in most car accident lawsuits. However, there is always a possibility that even if the plaintiff collects money from the alleged drunk driver, there will not be enough money from assets or car insurance to fully compensate the victim for the total of extent of his or her loss. In this case, your Boston drunk driving accident lawyer may be able to assist you in filing a dram shop claim against the bar employees and their employer. This means that you could file a lawsuit against the bar for serving the driver who caused you to become seriously injured in a car crash. Unlike a typical drunk driver, the bar owner or corporation that owns the establishment will likely have a general commercial liability (GCL) policy that has substantially more coverage than necessary to fully compensate a victim who has suffered even severe bodily injury. According to a recent news article from CBS news, the parents of a son who was killed when an alleged drunk driver crashed into his car head on are suing the establishment that allegedly served drunk driver to the point of intoxication while knowing he would be driving home that night. In that case, plaintiffs claim the bar sold alcohol to defendant long after the point when he was intoxicated and then let him leave and enter a major highway in the wrong direction at speeds of upwards of 80 mph. However, it should be noted that this case is still pending as of the time of this article, and defendant has not been found to be liable by a court or jury.